As promised in my earlier post for the Raspberry Habanero Jam Crumble Bars, here is the recipe for Blood Orange Jam, Apricot, Oatmeal, and Walnut Bars lightly adapted from Giada De Laurentis’ Apricot Oat Bar recipe. 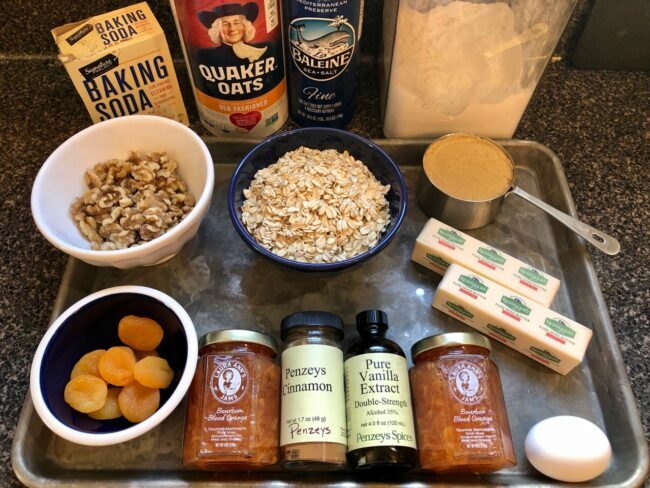 I thought the toasted walnuts and oatmeal crumble was total comfort food, and the amazing Bourbon Blood Orange jam from Laura Ann’s Jams with the addition of dried apricots, really kicked it up a notch. You can easily substitute any flavor jam or preserves you have on hand, just use a good quality one or otherwise it may be too sweet. 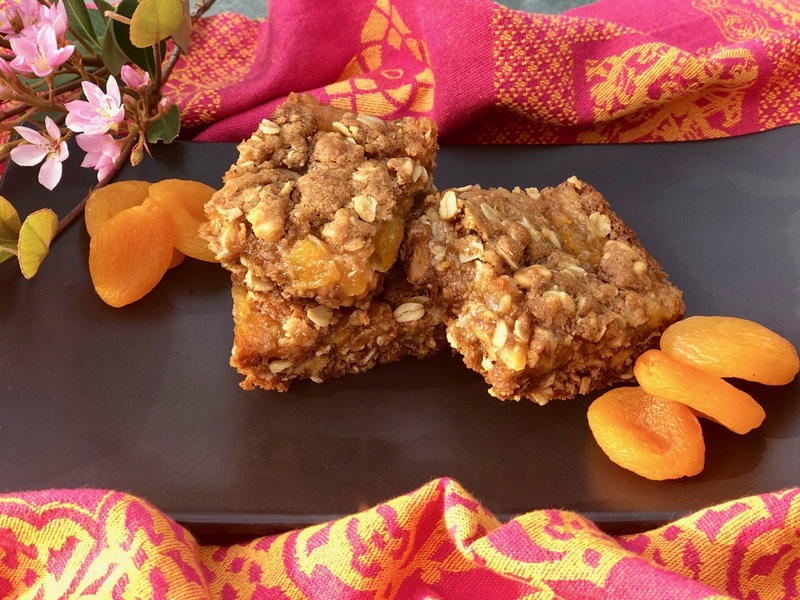 This recipe is easy to put together and makes about 24 bars as it’s baked in a 9 x 13-inch pan. Giada specifically called for a metal baking pan, which I did not have. I used a Pyrex pan, which worked just as well, although you may need to bake it a few minutes longer to achieve the golden brown crust. The original recipe called for leaving a small border around the edge of the crust, presumably because the jam will melt and ooze out sticking to the pan. The first time I made these that did not happen, and it left the edges and corners of the bars light on the jam. I recommend spreading the jam to the sides. 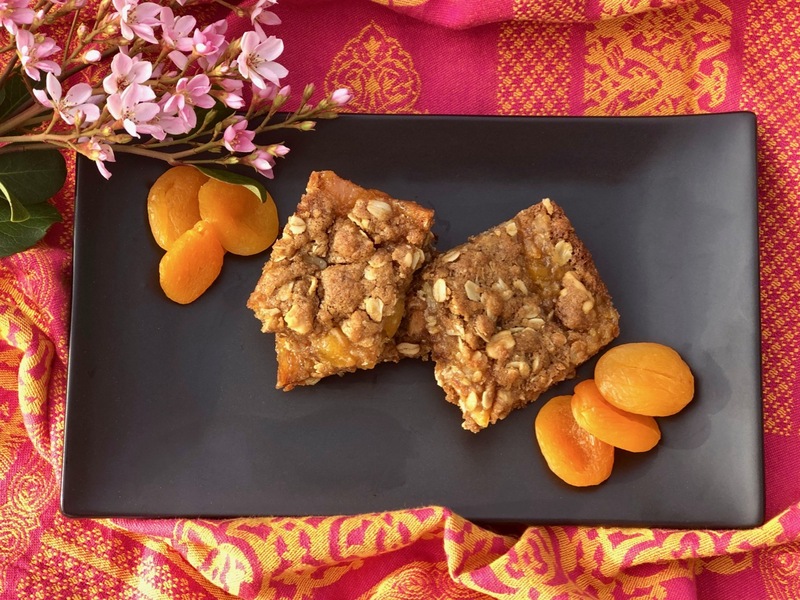 I also want to give a shout out to friends, Kim and Mary, who gave me a lovely bag of walnuts from their Northern California orchard, which I put to good use in this recipe. Preheat oven to 350°. F. Line a 9 x 13-inch baking pan with parchment paper leaving two inches of the paper hanging over the sides to use as handles to lift the bars out of the pan. Spray parchment paper with baking spray. In a small bowl, mix the jam and chopped apricots and set aside. In a large bowl, whisk the flour, sugar, cinnamon, salt, and baking soda together. Stir in the oats and walnuts. Beat the egg and vanilla together and add to the flour mixture; stir until just combined. Stir in the melted butter until blended. Press half of the crust into the prepared pan with your fingers or a fork. Spread the jam and apricot mixture onto the crust all the way to the edges. 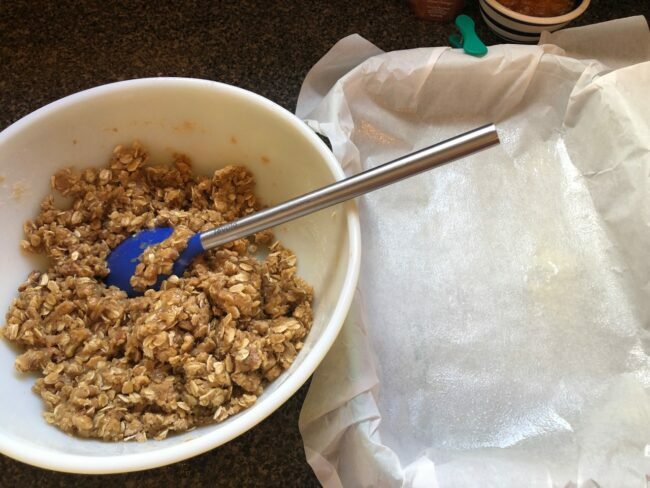 Crumble the remaining crust mixture over the top and press gently to flatten. Bake until light golden brown, about 30 to 35 minutes (5 minutes more if using a glass pan). 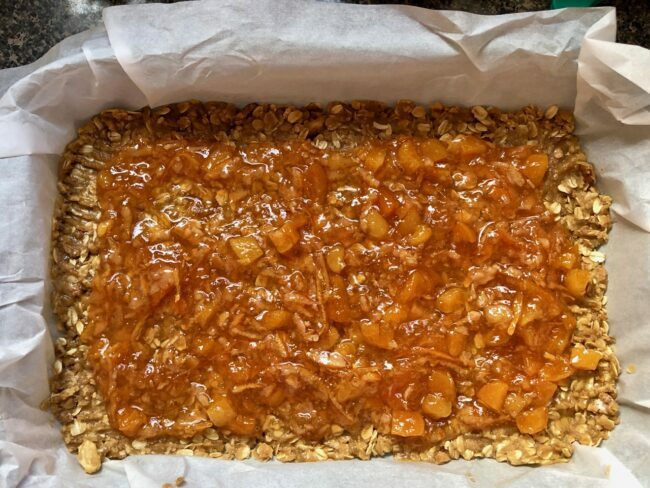 Let cool in the pan 5 minutes then using the parchment handles, lift the bars out of the pan and let cool completely on a wire rack before cutting the bars. They need to cool completely (at least 90 minutes) before you cut them, or the jam will ooze out of the bars. Makes 24 bars (can be stored in an airtight container up to 3 days). Recipe lightly adapted from Giada De Laurentis’ Apricot Oat Bar recipe.